Comparing wealth inequality numbers across several countries can be very tricky. Countries have different methodologies for calculating wealth. The cost of living varies dramatically within and between countries, plus there are all sorts of gaps in any dataset that incorporates information from Albania to Zimbabwe. The Credit Suisse Research Institute has a highly respected approach in its Global Wealth Report. Credit Suisse defines “net worth” as the market value of all assets minus any outstanding debts. Researchers calculated average wealth numbers by for adults estimated to be living in each country. We took the figures (Table 2-1 in the report) and mapped them onto a heat map of the world. 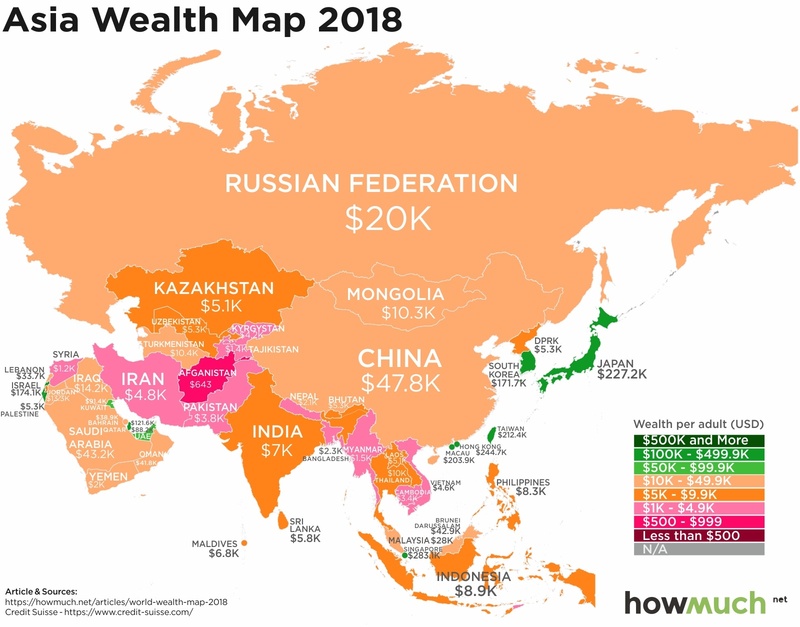 It’s important to note that average numbers like these can obscure crushing levels of poverty even in what appear to be wealthy countries, however they still provide an interesting snapshot of the wealthiest and richest countries in the world. Looking at the average net worth across the entire world indicates the enormous disparity between the developed world and everyone else. At one extreme, there are countries with net worth numbers over $500,000, and at the other extreme, there are places where people have less than $500 to their names. 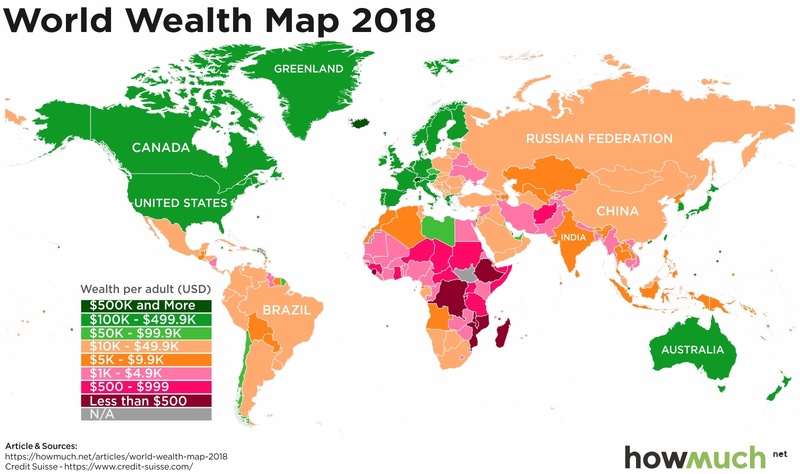 There is a smattering or light orange countries in between, but the worldwide map demonstrates an astonishing level of inequality between the have’s and the have-not’s. The story in North America is one of stark inequality. Northern countries like Greenland, Canada and the United States boast extremely high average figures. 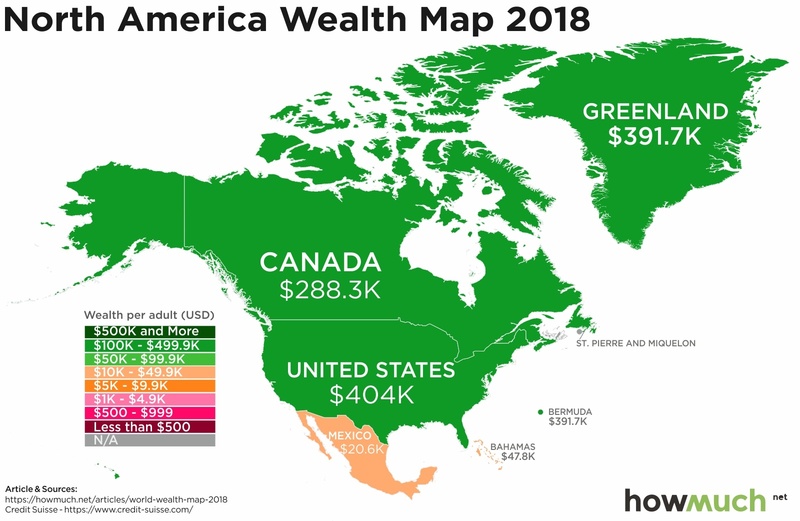 It’s no surprise that Americans are by far the wealthiest with $404K, but take a look at Mexico ($20.6K) and even the Bahamas ($47.8K). This means that the US is 10 times richer than the Bahamas and an eye-popping 20 times wealthier than Mexico. South America on the other hand reports some rather depressing numbers. Chile has the highest average in the region at $62.2K, followed by the Cayman Islands and French Guiana (both at $55.3K). 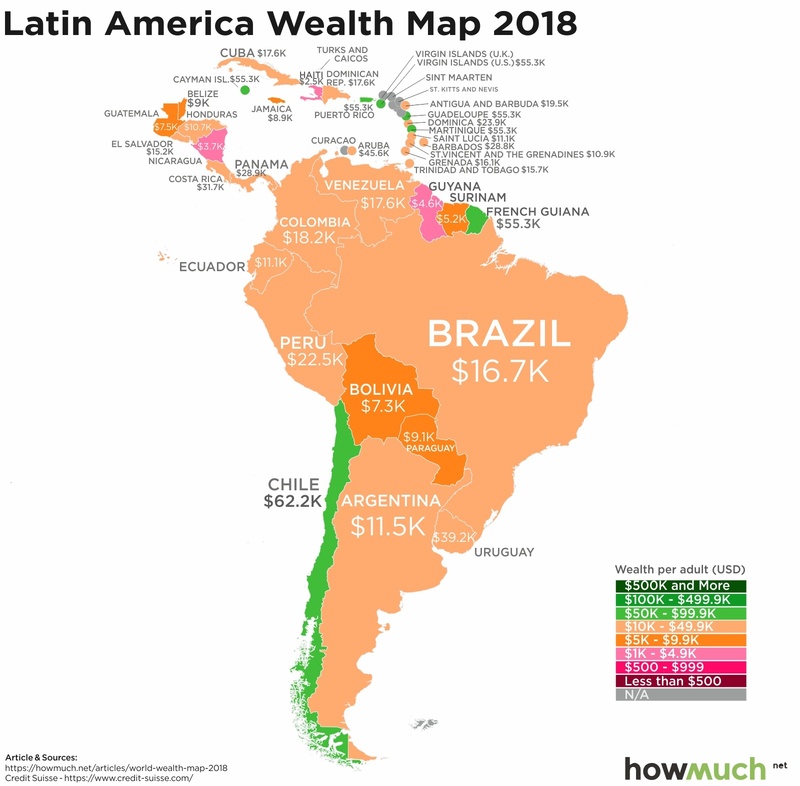 However, the average across all of Latin America is a tiny $24.4K. Haiti, one of the poorest places in the entire world, only has $2.5K per adult. That’s why immigration usually happens from the South to the North. Europe is the most fascinating continent in our series of maps for a few reasons. There’s an obvious contrast between East and West running right down the middle of the region. Germany ($214.9K), the Czech Republic ($61.5K) and Austria ($231.4K) fall into the upper (green) tiers on our map, but right next door, countries like Poland ($31.8K), Slovakia ($34.8) and Hungary ($37.6K) remain far behind. And the further east you travel, the poorer the country. Ukraine ($1.6K) and Belarus ($1.5K) are both worse off than even the poorest countries in the entire Western Hemisphere. 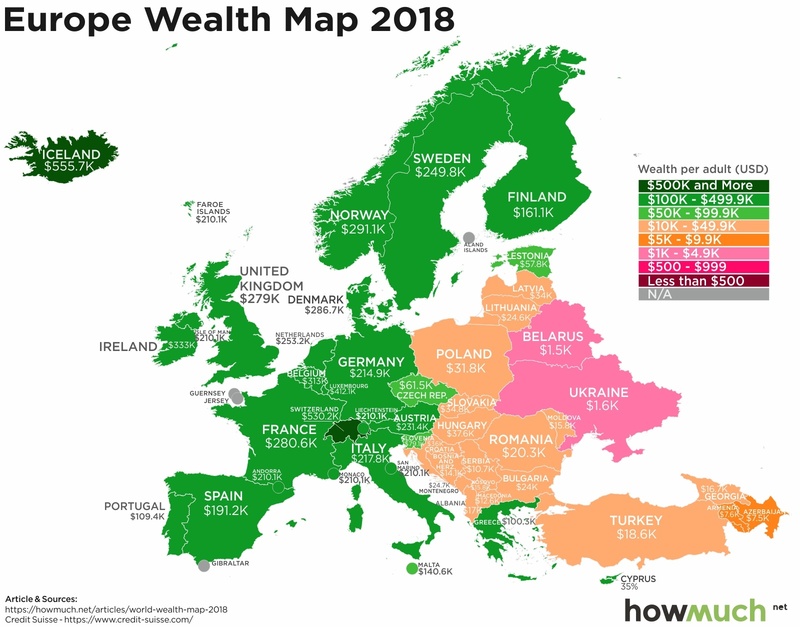 There’s another trend worth pointing out hiding behind our color-coded map, and that’s the difference in wealth between northern and southern European countries. In general, the further north and west, the wealthier the country. The situation in Africa is simply depressing. Our map highlights the soul-crushing extreme levels of poverty found in places like Burundi ($321), Ethiopia ($167) and Malawi ($141). To put these numbers in perspective, the United States is well over 1,000 times wealthier on an average individual basis. 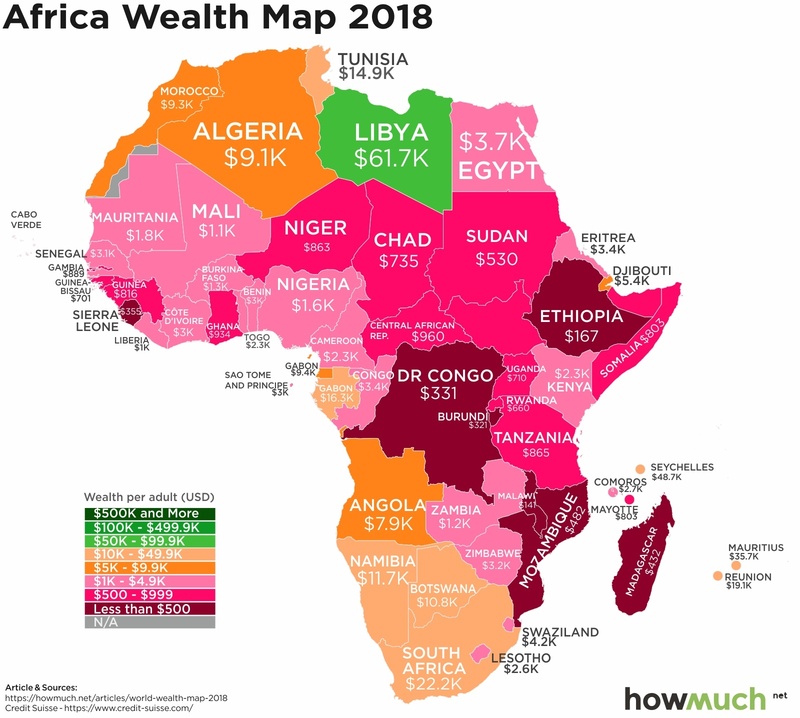 There is one pocket of relative prosperity worth pointing out in Libya ($61.7K), but not even this is good enough to break the top 50 wealthiest countries in the world. Our snapshot of wealth in Asia similarly provides an interesting view of the global economy. Take note of the line of relative poverty stretching from Syria in the west all the way to Vietnam on the Pacific Ocean. Now look at all the green countries, like Japan ($227.2K), South Korea ($171.7K) and Taiwan ($212.4K). Together with Singapore, Hong Kong, the UAE and Israel, these countries are all firmly aligned with American foreign policy and Western institutions. The wealth of these nations stands in contrast to adversaries like Russia ($20K) and China ($47.8K). 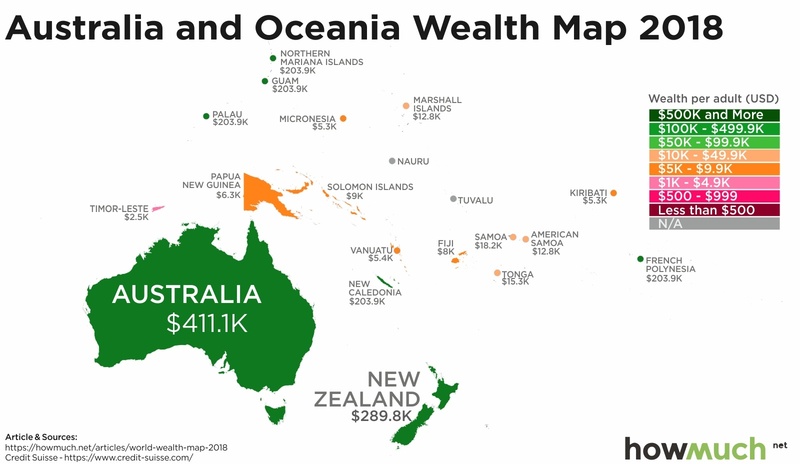 And finally, the picture of wealth in Oceania provides a nice bookend to our worldwide tour. Australia ($411.1K) and New Zealand ($289.8K) both stand out at the top of the pack, but some islands like French Polynesia, Palau and New Caledonia aren’t so far behind either ($203.9K each). Part of the explanation why is no doubt the robust and longstanding high-end tourism industries in these countries, which provide relatively strong individual wealth numbers. Want to learn more about global poverty and inequality? Check out our other recent article on extreme poverty rates around the world.